In honor of Constitution Day, Cowley College’s Media Club offered free pizza to those willing to sign away their First Amendment rights Friday in the Brown Center. Thanks to a Title IV provision Sen. Byrd (D-WV) in 2004 slid into the funding bill, institutions of higher learning are required to recognize Constitution Day on their campuses each year. Along with the free pizza in the Wright Room, David Smith's choir was joined by fellow students to sing the National Anthem in the lobby of the Brown Center. Also, the W4K (Women for Kansas) hosted a voter registration booth for students wanting to Register to vote. Each attendee was given a 'passport' detailing what it would be like without First Amendment rights. 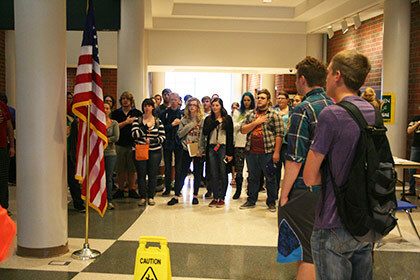 Marlys Cervantes had her creative writing students write about the Constitution, while theatre students participated in the Free Food Festival by helping to progress the message about the First Amendment. “For creative writing students we focus on freedom of expression, freedom of speech, and freedom in writing ideas, so I am glad this is such a big event on campus,” Cervantes said.